Single and Double Hung Windows can be both functional and aesthetically pleasing. They are both standard windows that will look good in any room and come with various design styles. Incredibly air tight triple weather stripping lowers heating and air conditioning costs. Ultra secure interior glazing bead resists winds of up to 350km/h. Easy to operate finger tilt triggers and easy to clean. Insulated glass for amazing energy savings. Extra long lasting spiral balance hardware. 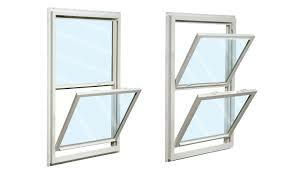 Single Hung windows are double sashed, one moving and one fixed. To open, simply slide the bottom sash up. The easy to use Constance Force balance technology means they can stay open in any position. Make us your 1st Choice to install your Single Hung Window or your Double Hung Window with our professional and quick installers.